Would you follow this man? When the Cheese Magnet crew embarked on this Favorite Movie project I felt a little left out. Unlike the other guys, I don’t have a single favorite movie. I have many that I love for different reasons: The Maltese Falcon, Blazing Saddles, Solaris (original version), The Good, The Bad and The Ugly. After thinking it over for a few days I decided if I have to name one favorite, it’s Aguirre, Wrath of God. 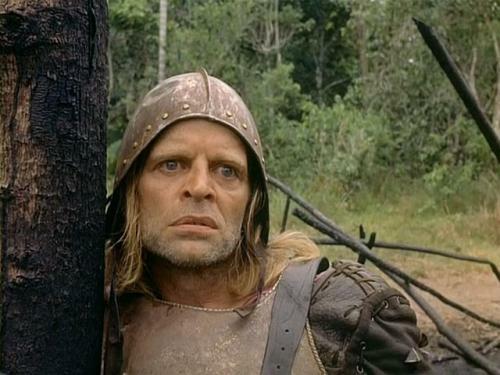 Werner Herzog’s story of an obsessed conquistador on a doomed expedition to discover El Dorado was his first collaboration with Klaus Kinski and given the conflicts between the two men it’s remarkable that they not only didn’t kill each other but they went on to make several other films together. Like many of Herzog’s films, Aguirre is shot in almost a documentary style – you get the sense that this really is a group of conquistadors with a small camera crew along for the ride. But it’s not an affectation, Herzog isn’t constantly shaking the camera or letting the boom mic intrude into the shot to make you think it’s a documentary. You’re simply there watching all the insanity unfold. And there is insanity by the bucket, thanks to Kinski. I’ve always had the opinion that all actors are at least a little insane. How else to explain the ease with which they slip in and out of character and convincingly portray emotions, even crying on cue? But Kinksi was genuinely batshit crazy and you can see it in this movie. If he wasn’t insane it would be the most amazing acting job in the history of cinema but the stories of his craziness through the years are enough to convince me this ain’t all acting. He portrays Aguirre with a bizarre manner of moving, ostensibly the result of battle injuries but the effect is he seems like some sort of reptilian creature, more at home living under a rock than leading an expedition. This isn’t really a descent into madness so much as it is the rise of that madness due to an opportunity that presents itself. Aguirre isn’t driven crazy by the quest for gold, it’s simply an excuse for taking control of the band of men and allowing his messianic urges to take hold. Like my other favorite director Andrei Tarkovsky, Herzog uses imagery to instill emotion in the viewer. Of course all directors do that but these two especially are not afraid to let the camera linger on a landscape shot for a minute or two, or even longer. This can serve to give you time to mentally digest the scene you’ve just witnessed, allowing you to really think about what you’re seeing rather than being bombarded by scene after scene of plot, dialogue, action, etc. Many people find these type of films to be boring and ponderous. To each his own but I find them to be highly emotional and thought provoking. This is a movie you have to decide to pay undivided attention to, not in the sense of studying every scene but you really need to kick the kids out of the house, turn off the cell phone and just absorb it to get the full experience. In that context a film like Aguirre (or Solaris, or Stalker, or Fitzcarraldo) can be almost mind altering. I haven’t talked too much about the actual plot or Herzog’s usual theme of an obsessed man in a doomed struggle against nature. There are plenty of commentaries out there if you’re interested in that. There’s no shortage of stories about what happened on set either, and some of it may be true: Kinski may have shot a crew member, Herzog threatened to kill Kinski (or was it the other way around? ), the entire film was shot on a stolen camera, Kinksi’s dialogue was dubbed because Kinski wanted more money to do the post-production dubbing. 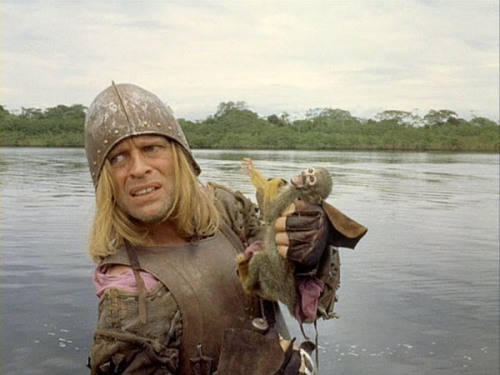 Regardless of all the behind the scene craziness, Aguirre, Wrath of God is a remarkable film. In some ways I wouldn’t even say it’s Herzog’s best film but it’s my favorite and maybe my favorite movie ever.